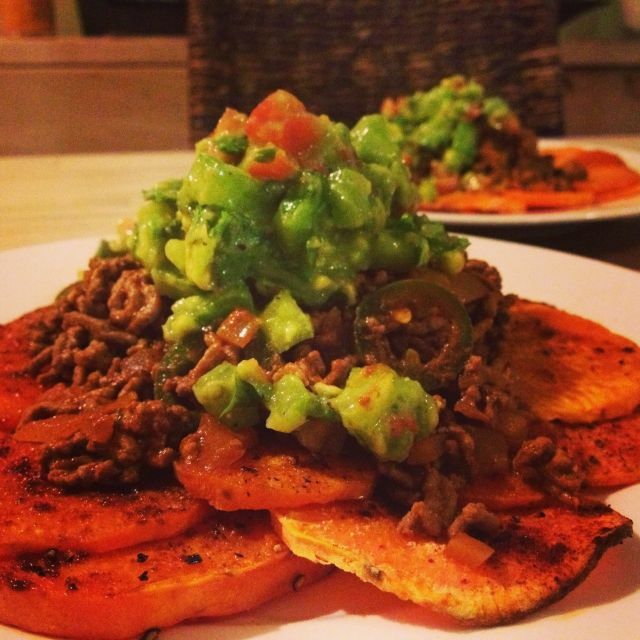 These paleo nachos are absolutely SCRUMMY! They sure are one of our go-to paleo dinner meals and everyone LOVES them. They will impress every dinner guest, trust us! Peel the sweet potatoes and slice as thin as possible. Line baking trays with baking paper and brush the paper with coconut oil. Evenly place the potato slices on the tray. Brush the tops of the potatoes with coconut oil. Season the potatoes with the paprika, onion powder and salt n pepper. Put into the oven and put your timer on for 12 minutes. Heat your fry pan on high, place the coconut oil, garlic, fresh chilli/jalapeño and onions and stir for 1-2 minutes. Add your mince and cook until just brown. Add all the spices: paprika, cumin, chilli powder and thyme. Keep stirring. Once the spices are mixed throughout the mince, add the tomato paste and water. Stir and allow the sauce to just come to the boil. Turn down the heat to medium and let simmer for 10 minutes. Your sweet potatoes have probably beeped already, so when they do, turn the potato pieces over and bake for a further 10 mins (or until nice and crispy). To serve, place your sweet potatoes on a plate with two large spoonfuls of nacho mince. On top, place a nice big dollop of guacamole!